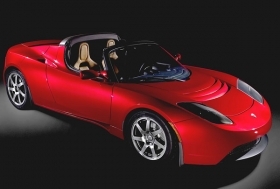 Brad Pitt and George Clooney are owners of the 84,000 euro Tesla Roadster. NEW YORK (Bloomberg) -- Tesla Motors Inc., the electric sports-car company that's attempting the first initial public offering by a U.S. automaker in a half-century, increased the number of shares that it will sell in its IPO by 20 percent. The maker of the 84,000 euro ($105,000) electric Roadster that is sold in at flagship stores in London, Munich and Monaco will now offer 13.3 million shares at $14 to $16 each, up from an earlier plan to sell 11.1 million, according to a filing with the Securities and Exchange Commission. Existing shareholders including CEO Elon Musk will sell 1.42 million instead of 1.1 million. Tesla, which has lost money every year since its founding in 2003, is seeking to raise as much as $213 million to pay for factories and possible acquisitions, according to the Palo Alto, California,-based company's filings with the SEC. The IPO scheduled for Monday will be the first by an American car company since Ford Motor Co. went public in 1956. Musk, who has staked his personal fortune to Tesla after making almost $300 million selling PayPal Inc. and Zip2 Corp., is counting on investors to fund a startup that expects to lose more money in the next two years as it tries to build a battery- powered sedan. While the IPO may benefit from Tesla's standing as the only producer of highway-legal electric cars sold in the United States, cheaper alternatives from established automakers may keep Tesla from turning a profit, Rochdale Investment Management LLC said last week. Musk, Tesla's biggest shareholder, co-founded PayPal, the online payment company now owned by San Jose, California,-based EBay Inc., and is CEO of Space Exploration Technologies Inc., a Hawthorne, California-based company that builds spacecraft. He has spent more than $70 million of his own money on Tesla while selling about 1,000 Roadsters to film stars such as George Clooney and Brad Pitt, musicians and battery-car advocates. While the automaker has burned through $230.5 million in cash and posted losses in every quarter since it was founded in July 2003, Tesla attracted Toyota City, Japan,-based Toyota Motor Corp., the world's largest automaker, which plans to buy $50 million of shares alongside the IPO. Tesla and Toyota said they may cooperate on electric-vehicle development, though they haven't signed agreements to do so, filings show. Mountain View, California,-based Google Inc.'s founders Larry Page and Sergey Brin, the government of Abu Dhabi and Daimler AG of Stuttgart, Germany, are also investors. Goldman Sachs Group Inc., Morgan Stanley and JPMorgan Chase & Co. of New York, along with Frankfurt-based Deutsche Bank AG, are leading Tesla's sale.